The report SEMrush keywords, after entering a keyword in the search engine displays information about organic positioning, payment Adwords words, and information on keywords related to your chosen keyword. One of the most important tasks of the work of any professional undertaking the task of SEM or SEO is choosing the keywords on which will be based positioning strategy, and to perform well this task is best to have tools that have detailed information on results of both organic and sponsored search, to help us find keywords with which we can get the best results for our goals, both traffic generation and conversion into leads or sales, for example. 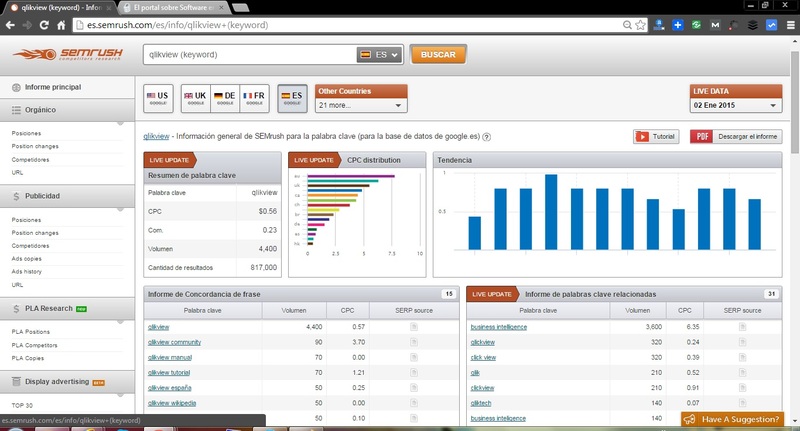 One of the best SEO tools to find the best keywords for our business is SEMrush . In this video tutorial we will see how to get new keywords for both organic positioning as adwords, based on a theme or keyword initial. I want to improve the positioning of the web of my business, but why where do I start? One of the most effective SEO actions is to find keywords that are already positioned, and lead to pages on our site that we have not optimized for these keywords. With just a little SEO onpage optimization for these words, and optionally some actionoffpage SEO, and get some more quality incoming links. These secure pages go up positions in search engines, and will bring many more visitors to our site. SEMrush makes us easy to get this list of keywords positioned we are going to bring a lot of traffic with little effort.